Q&A Clare Campbell executive director at Wildlife Asia. You would think that Clare Campbell executive director at Wildlife Asia never sleeps considering she split her time between the major work on protecting the last tracts of rare pristine forest landscapes in Burma, called Burmas Last Eden, the Karen State, being president and chairman of organisations deeply engaged in rhinos, Silvery gibbons and orangutans. Clare Campbell took some time out of her busy schedule while having 8 hours stuck in a car to talk about the most urgent things in the world right now, the extremely hard work of saving our home, not only for gibbons and rhinos but all living creatures including humans: "Without forests we are all doomed"
Q: You are deeply engaged in rhinos and gibbon conservation , the list can go on: Where did you grow up, was the environment /animals something that you discussed around the dinner table? "I grew up in country Victoria,Australia, in a lovely historical (but cold and wet!) town called Ballarat. Holidays were always spent camping, usually on the Murray River but playing outdoors. amongst nature, was how my childhood was enjoyed. I think my connection to animals was very instinctual and just part of my soul, but the lifestyle and travel opportunities my parents provided certainly fostered that. I wouldn't say there was huge awareness around environmental protection back then, but I certainly I had a very strong sense of empathy and love for all creatures from very early on." Q: When did your interest in nature turn into a commitment for life, was there a moment when you decided to take action? "I do sometimes chuckle at a particular 'moment' in primary school when I bared my heart and soul to a friend and boldly claimed that i wanted to 'save the world'. I'm not sure I quite understood back then the enormity of such a task but I certainly always had an innate desire to protect and to make things better! My mum would say my future was clear from the moment, as a 5 year old, I lovingly wrapped two dead fish my father had caught, in a blanket, and carried them around for a week! My zoo career is what channeled my attention towards Asia, in particularly a bond I developed with a special little gibbon called Jermei. She stole my heart and I sometimes joke that she also stole my choices. She needed help, but so did her entire species and so it began. From there, the evolution of my crusade has grown from being primarily welfare driven to big picture landscape conservation focused. I guess I am now striving for a fundamental shift in human values and a vision where people and nature exist in harmony." Q: Whats is your future vision and mission of Wildlife Asia, we see you have a great impact on the region? "Wildlife Asia was borne from a desire to tackle wildlife conservation more holistically. Whist working at Perth Zoo for 13 years I had been running two smaller species focused NFP's, one for Silvery (Javan) gibbons and one for Asian rhinos, species that I continue to be particularly passionate about. I knew that protecting individual species for species sake was not the answer though and that we should really focus on the incredible landscapes that these animals live in. Without forests we are all doomed and we have to do a better job at engaging local people, the international community and of course governments, in ensuring that this becomes a priority. We really wanted Wildlife Asia to offer supporters a chance to make a tangible contribution to conservation. We all get a little caught up in our modern day materialistic and busy lives but most of us are more well off than we ever truly appreciate. It's easy to give something back but people want to know that their money won't be wasted. They want honesty. They want integrity. As a small NFP, we are committed to maintaining that. There is so much more scrutiny of charities these days, which i think is a good thing really. Wildlife Asia has proven that we can build and maintain relationships with local communities and partners and these people are the most important players. It's not about us building a huge profile and splashing our logo all over the place. We prefer to give local people the tools and the resources to manage their resources in a way that will ensure sustainability and improvement of human wellbeing." Q: You have managed to start the worlds first ever Gibbon Protection Unit, why and what is the largest threat to the gibbons? "Gibbons are actually one of the most threatened primate taxa globally. Found across South-east Asia they suffer much the same threats as their larger ape cousins, the orangutans, but with far less attention. The illegal trade in gibbons for pets is huge, with a shift to online markets in recent years. Forest destruction and human encroachment have also significantly reduced their habitat. The Gibbon Protection Unit was established in Java primarily to protect a reintroduced population of Javan (Silvery) gibbons. Their role is to prevent poaching and other illegal activities but also to work with surrounding communities, to improve farming practices and livelihood opportunities. Local communities are the key to long-term wildlife protection. Conservation and human wellbeing cannot be addressed in isolation from one another. This is a mistake that conservationists have made for too long now and I believe it is why, after billions of dollars invested, we see very few examples of successful long-term solutions." Q: Are you ever scared of poachers, as you are protecting animals that are - sadly - high in demand on the black market in East Asia? "There is always a risk in everything we do and sadly, very little regard for human life in some of the areas we work. I do not take unnecessary risks, especially as a foreign woman in a hostile environment. Our ranger teams are highly trained and equipped and best placed to be in the field keeping poachers at bay! Having said that, I always work alongside local partners, who take our safety and security very seriously. To be honest I probably feel more 'at-risk' and threatened on my morning walk in Perth!" "Ahhhh, where to start.....the signs are all around us. In my own back yard here in Australia, the changes in weather patterns are undeniable. It is even more frightening in Asia though, with such a dramatic shift in seasons, a change that has been quite obvious in the 15 or so years I have worked there. I find it utterly frightening what lies ahead for us in relation to climate change, and equally, population growth, which I feel as an issue of equal magnitude but one that no one really wants to discuss. It's easy to sit back and ignore these issues and to think that it's too late, both issues have runaway now and what can we as individuals possibly do? Even if that were true, wouldn't we at least try? If you have chosen to bring children into the world, wouldn't you do everything possible to make sure they won't be existing in a living hell in the next 40-50 years? It should be clear to us all now, that governments, whether in developing or developed nations, will not act in the best interests of the people and the planet. It is up to us. Lead by example. Speak up. Choose right. Do whatever you can, whenever you can." The Leuser Ecosystem in Aceh, Sumatra is the last place on earth where orangutans, rhinos, tigers and elephants co-exist. All four key species are now classified as Critically Endangered, primarily due to the rapid conversion of their forests into palm oil plantations but also under increasing threat from wildlife poaching. Q: Are you a vegetarian/vegan? "Yes I am a vegetarian and we eat vegan food as much as possible. I don't actually like labels though as I think it becomes more about status and pop culture than an authentic shift in values. Veganism is just one of the many positive choices we can make. Waste reduction, renewable energy use, conscious consumer choices are all important. Underlying all of that, we have to somehow re-establish a connection with our environment. This respect and understanding, and affinity with our 'country', which many indigenous communities still have has evaporated from modern society. We instead focus on growth, immediate gratification, on personal wealth and possessions and we wonder why greed and narcissism rule the world?" Photo: Paul Hilton. A critically endangered Sumatran rhino roams the Leuser Ecosystem, only time will tell if we manage to save this equatorial forest from conflict palm oil. Q:What do the locals think about you and the work that you do, are they happy you are there? The Karen Wildlife Conservation Initiative for ex. is community-led. "The local communities are the ones doing the work. We are merely there to support them in any way that they need. We work where support is welcomed and try to avoid the mistakes of our colonialist predecessors who have often approached conservation with a saviour mentality. The KWCI is an outstanding example of the kind of co-operative partnerships that we work hard to develop. In Karen State, we have local communities and organisations, who despite decades of civil conflict and enormous personal loss and grief, are driven to protect their biodiversity and culture and to have a peaceful and sustainable future. Without the incessant demand and grab for their resources by the government and foreign investors, they could simply be left to their own devices to do that successfully. The reality is though that they do need to support to ensure their strategies and governance are solid and that in the short term at least they can mitigate threats from poaching and unwanted development." "Being deeply connected. To nature, to people and to animals. A feeling of purpose and having a positive presence in this universe and in finding joy and beauty in the smallest of things." "It should be clear to us all now, that governments, whether in developing or developed nations, will not act in the best interests of the people and the planet. It is up to us. Lead by example. Speak up. Choose right. Do whatever you can, whenever you can." - Clare Campbell. Photo: Paul Hilton. 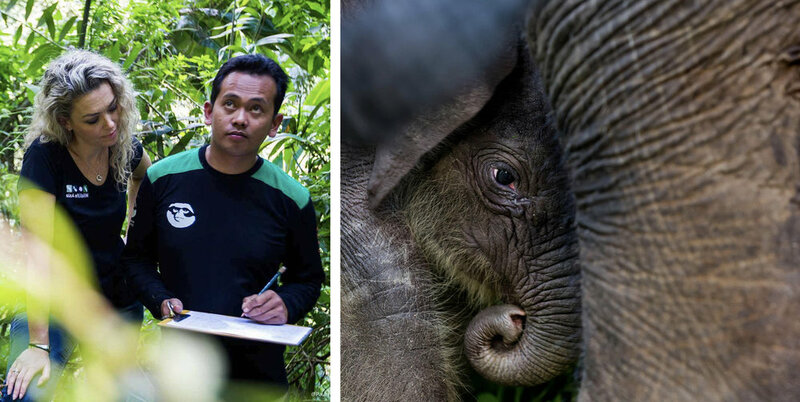 Oil palm plantations forcing wildlife, including Critically Endangered Sumatran elephants, to live in ever-shrinking habitat, fortunately this elephant was saved by Wildlife Asia.